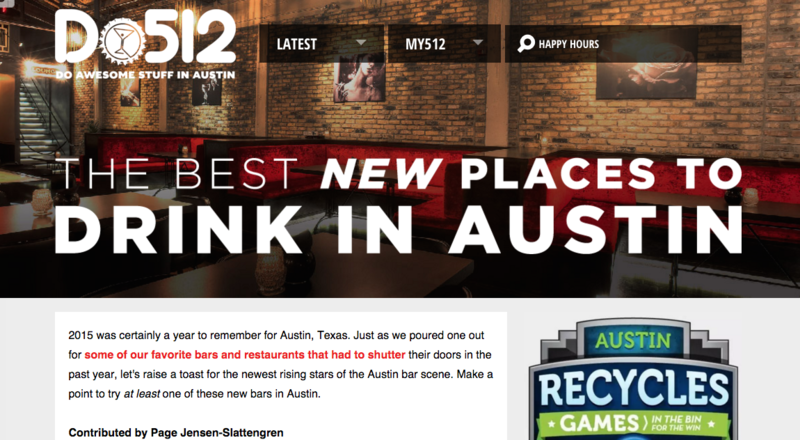 Named one of the best new places to drink in Austin, Oasthouse is honored to be featured in DO512 and in such good company! Thanks for the support, Austin! 2015 was certainly a year to remember for Austin, Texas. Just as we poured one out for some of our favorite bars and restaurants that had to shutter their doors in the past year, let’s raise a toast for the newest rising stars of the Austin bar scene. Make a point to try at least one of these new bars in Austin. Fresh to the Northside is the much celebrated Oasthouse Gastropub, a friendly neighborhood pub featuring German-inspired fare, seasonal cocktails, and an extensive beer and wine list. Try the: pub classics such as spaetzle or bangers and mash with sophisticated cocktails including the “Good Morning” a blend of Buffalo trace, almond milk, and orgeat.